In years past, I used to play good old World of Warcraft and some days, I miss it. Today was one of those days. There’s a lot of things I don’t miss. The gear treadmill, the pet battles, the PvP, the raiding, the often hostile and toxic community, the ridiculous amount of abilities and hot bars, and so on. Some of things I miss include the vast worlds, the music and the lore, and of course my old guild. We certainly had some good times together. Even if we were all a little insane. But one of the things I miss the most are my characters. I don’t know if it’s because I was on an RP server (and actually roleplayed sometimes) or if I just have a good imagination, but many of them had distinct personalities. In a way, they were all a part of me, yet evolved into something unique and sometimes unexpected. 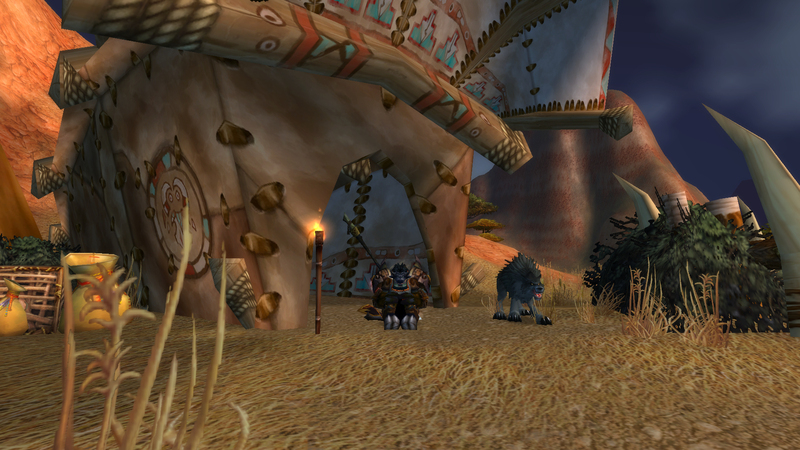 My favourite will always be Niqora Wildstride, the tauren hunter with Blacky the wolf as her constant companion. She was a bit of a gentle giant: always soft-spoken, patient, and wise. Despite having seen many atrocities, a conversation with her was always punctuated with smiles and low laughter. 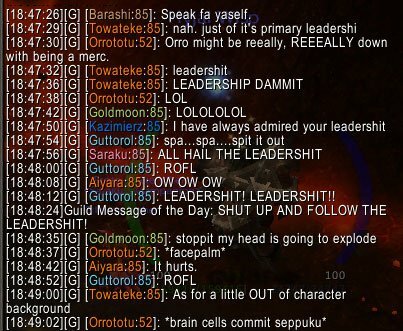 I miss Saraku’s naive yet wonder-filled outlook on the world. I’m sure I committed some great faux-pas by roleplaying a netherdrake-in-blood-elf-paladin form but his utter devotion to Niqora and his awkwardness made him such an interesting character. Besides, getting him drunk was downright hilarious. Aroqin was likely the grumpiest and most acerbic night elf anyone had ever met. Forget the ol’ wise and stoic druid, Qin told it like it was and was never ashamed about it. Almost constantly in cat form (because I hate the female night elf’s idle bouncing), she absolutely delighted in tormenting her eternally cheerful and naive rogue companion. Then there was Iyocene, the undead death knight. Dying and being resurrected twice either addled her brain or caused her not to give a crap anymore. If she wanted to carry around a weapon that was little more than a tombstone tied to a tree branch, then she was going to do it AND love every head-smashing minute of it. The squishy sounds were music to her ears. There were more characters too. Zulrea the troll shaman who must have had the patience of a saint to be able to watch out for a young and bratty orc warlock. Niqora’s adopted son Tuyok who was trying to figure out his place in the world and prove that he could be a great warrior. Anuun, the stubborn yet unfocused younger sister of Niqora who turned from a hunter to a priest, and would beat the Light into an enemy’s skull if she had to. Brindu, the orc warrior who felt a great honour and loyalty towards the Horde, and was yet trying to reconcile her role as one of the many soldiers under Garrosh’s command. I know a lot of people are fans of this NPC or that but to me, they were largely part of the background noise, something as unchanging and scripted as the landscape. It was my characters and the way I imagined them reacting to different situations that really brought the world to life. Even though WoW is a world that I’ll likely never go back to, I miss looking at it through their eyes and sharing their experiences. But somewhere within my imagination, they’re all sitting around a campfire and telling their stories to each other. I think that’s how I like to leave them be. I’m framing up that final paragraph of yours as one of the best and most moving quotations on gaming I’ve ever seen. Oh wow, thank you. And here I was thinking that folks would see me as odd for giving life to my characters in my head. Isn’t that what RP is all about? Especially ‘internal roleplay’, where you don’t actually interact with other RPers but simply roleplay your own playthrough. Which is basically all I do these days. I never thought of it that way before. I learned about roleplaying through WoW so I’ve always thought of it as something you do with other people. In which case, I’ve been internally roleplaying for years, what with all of the stories I’ve made up in my head about my various characters.